The Board of Regents unanimously approved a 3 percent tuition increase and an operating budget that eliminates over 60 positions at a special meeting May 17, 2018. Undergraduate tuition is set to rise by $280 a year this fall as three university divisions are cut by $5.8 million to cover low enrollment and rising costs. 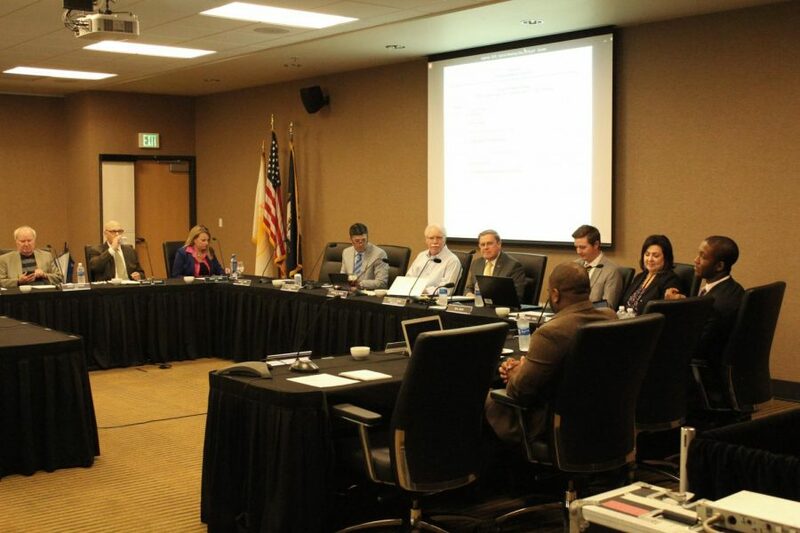 At a special meeting Thursday, NKU’s Board of Regents unanimously approved both the tuition increase and the operating budget for 2018-2019, a budget delayed by late action in the Kentucky legislature last month. Interim president Gerard St. Amand called that session “a wild roller-coaster ride” where NKU had to dodge state cuts, battle skyrocketing pension costs and advocate for funding on-par with other state universities. “The end result of that session was actually a positive one from the standpoint of that state appropriation, much more positive than we could have imagined on Jan. 16 of this year,” St. Amand said. Previously, the impact on NKU’s budget was estimated to be over $20 million and nearly 150 position cuts. Because of new pension legislation and the addition of performance funds to the Kentucky budget, that outlook has changed to about a $9 million spending deficit and fixed cost increase. Amid a seven-year enrollment decline and rising investments in scholarships and financial aid, the tuition hike is expected to mostly offset a $3 million spending deficit, according to NKU Chief Financial Officer Mike Hales. The state is expected to give NKU about $5 million in performance funds that cancel out cuts and net NKU about $2.4 million. But, increasing utilities, insurance, HIC start-up costs and student financial aid total $5.4 million, causing the deficit. Hales expects the tuition rate increase to generate an extra $2.4 million, bringing down the projected deficit. “We have to factor in we’re expecting a tuition shortfall of about $600,000,” Hales said. The 3 percent raise is consistent with past tuition increases; on average, the Board of Regents raises tuition about 5.5 percent each year. With the increase, NKU ranks fourth-highest for in-state tuition among the region’s eight public universities. Currently, the highest in-state tuition is University of Kentucky’s $11,942, and the lowest is Murray State University’s $8,820. The new budget re-allocates $5.8 million from three university divisions and cuts 11 filled and 52 vacant faculty and staff positions. Academic Affairs will be clipped by $3 million, Administration and Finance will be cut $2.5 million and Student Affairs will be cut by $300,000. Most of the re-allocations come from personnel cuts, but it has not been decided which positions will go. Hales said notifications to the employees affected “will be communicated no later than June 29.” Additionally, NKU will invest in 42 new positions as soon as next year. The budget office used faculty surveys, open forums and sessions with Faculty Senate, Staff Congress and the Student Government Association to determine some of the budget priorities. “It’s not a process that we just have a few people making decisions for these reallocations and cuts and things like that,” Hales said. The $5.8 million in recurring and non-recurring costs in 2019 covers safety updates, instructional resources, employee raises, deferred maintenance and other projects. St. Amand is scheduled to give a budget address to campus 9 a.m. Friday in SU 107. The event will be streamed here. Follow @northernermedia on Twitter for live updates. How much will you pay in tuition this fall? Check out the new rates below, and see which course fees are rising here.